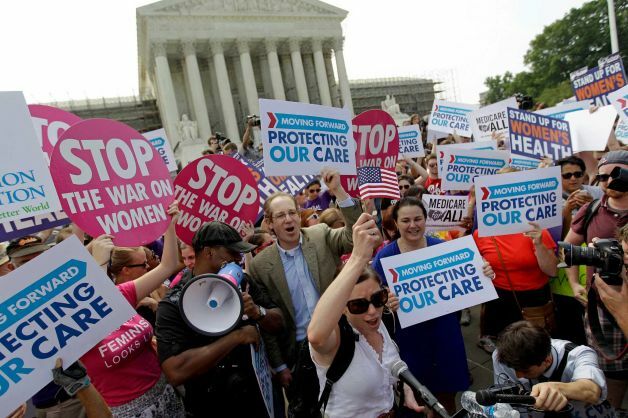 Supporters of the Patient Protection and Affordable Care Act celebrated as the Supreme Court announced its decision to uphold a milestone of the Obama presidency. This long overdue, common sense legislation has already benefited millions of Americans and will assist more as the Act’s provisions continue to go into effect. Jeb Bush recently found himself in hot water like a crustacean at Red Lobster for saying former president Ronald Reagan would have a tough time being accepted by today’s Republican Party. Bush took criticism from his own party for his comments, but he brought up an interesting point… that was dead on. Those that meet the requirements are also eligible to apply for work permits. The GOP has been consistently blocking nearly all potential job growth legislation from the Obama administration. The most damaging block was the American Jobs Act, which, as we pointed out in the entry The One About the Pipeline, would have provided more jobs to the state of Iowa alone than the Keystone pipeline could provide for the nation. Yesterday, a Michigan committee from the Republican-led House passed an abortion bill that could drastically limit the healthcare rights of women. Déjà vu, anyone? I literally take breaks from writing about all of the GOP-backed legislation against women’s healthcare because there are so many of them. I’m not kidding when I say that I could post a new entry every week on a different bill being written or going under a vote. Yesterday saw the Republicans block yet another bill that would have assisted the American public.